Bill McKibben is a well-known environmental activist and author. 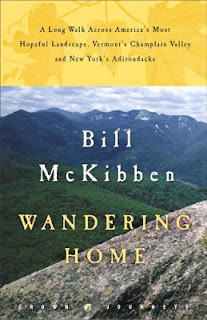 While inventorying our library's travel collection, I came across his 2005 title Wandering Home: A Long Walk Across America's Most Hopeful Landscape: Vermont's Champlain Valley and New York's Adirondacks, an account of recent hike through the forests and mountains that transformed him several decades earlier from a suburbanite to a nature enthusiast. The hike started in Vermont near Robert Frost's cabin near Mount Abraham, headed generally west (with lots of long curves), and ended in New York at his house near Garnet Lake. Some portions of the trail was harder than he remembered and he took one good fall, but mostly it was a delight, as he was joined for stretches by friends, most of whom are also environmentalists. In their conversations, they told McKibben their career stories. The narrative also reveals how the Northeastern United States has become a symbol of conservation and restoration. It is one of the few areas on earth in better shape now than 100 years ago. At this point, McKibben has written many books. This is one of the shortest and most leisurely. It is a good introduction to his important body of work. Readers who enjoy travel accounts will especially appreciate Wandering Home. McKibben, Bill. Wandering Home: A Long Walk Across America's Most Hopeful Landscape: Vermont's Champlain Valley and New York's Adirondacks. Crown Publishers, 2005. 157p. ISBN 0609610732. I'm sure a careful student of biography such as you, will have a factual and scientifically proven basis for this statement.
" It (Northeastern United States) is one of the few areas on earth in better shape now than 100 years ago "
The statement comes from McKibben. He was specifically discussing the recovery of forests that had a one time been clear cut and farmed. Many have repopulated with fauna and flora over time with little human direction. In many other regions, particularly the American West where soils are thin, disturbed environments recover more slowly if ever.